Did William contribute any genetics to this child??? He is a cutie, love that face!!!! Well we do know that he contributed a "Y" instead of an "X." Louis' expression is so dang cute. And, having exhausted himself, gave the rest of the job over to Kate. Kate always has the most perfect "toothpaste commercial smile." Louis is all Kate til the Windsor gene rears its bald head. Yep, and she paid a pretty penny for it too! Or mummy and daddy did (I would assume). 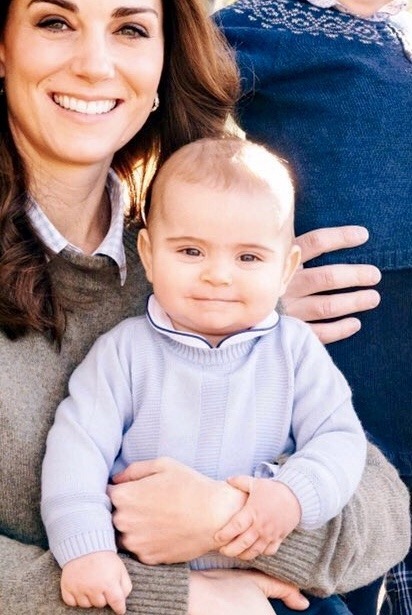 Prince Louis of Cambridge is the first Prince Louis in the British Royal Family for more than 100 years. I just saw them whilst scrolling on Instagram. He's very cute and very much like his mother! He is very sweet. I think he and Charlotte resemble each other a lot in the new photos. Is it the one with the blue and the maroon tops? He's going to be an intriguing looking kid if that's him. I found them on the explore page, find a Kate Middleton page and then similar pages will show up. Oh yeah. He’s Kate Jr!